Baking chicken in aluminum foil traps the moisture so that the poultry remains moist. Tightly sealing the foil while leaving air space above the chicken allows the hot air to circulate inside the package. Using this method of preparing the chicken allows you customize the flavorings you add to the chicken, to suit your tastes. Add your choice of seasonings to the chicken, top the poultry with fresh herbs or even include fresh vegetables in this steam foil packet for a simple meal. 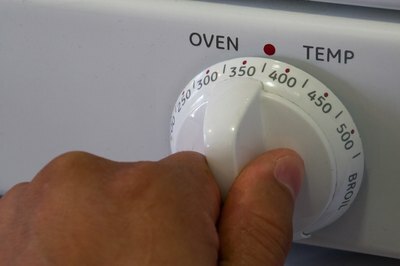 Set the oven to 375 degrees Fahrenheit to heat it while you prepare the chicken. Tear off a piece of aluminum foil large enough to wrap around a chicken breast, covering it while still allowing for extra space between the chicken and the foil. Place one chicken breast in the center of the foil. Coat both sides of the chicken breast with olive oil. Season the chicken with salt and pepper, if you desire. Or, add other seasonings of your choice. 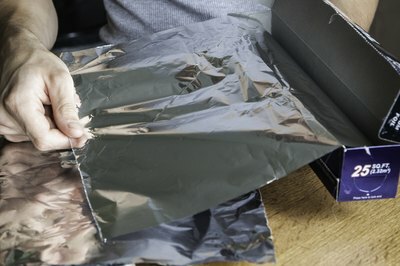 Create a packet by bringing both sides of the foil together. Crimp all sides of the foil together tightly, but leave room inside the packet to let the heat circulate. 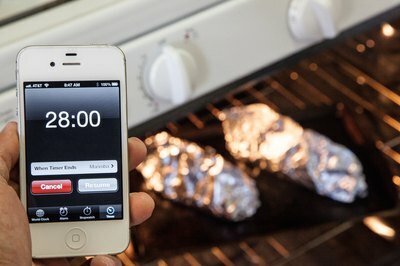 Place the aluminum foil packet onto a baking sheet. Repeat this process for the remaining chicken breasts. Bake the chicken for 25 to 30 minutes in the oven. Remove the chicken when the inside no longer appears pink and the breasts reach an internal temperature of 165 degrees Fahrenheit. Carefully, open one end of each packet to let the steam escape. Open the packets all the way and transfer the chicken to a plate. 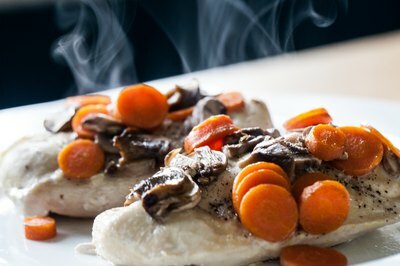 Place vegetables such as carrots, zucchini or onions inside the packet with the chicken. The heat will steam the vegetables. Open the packets carefully because the steam can burn your skin.